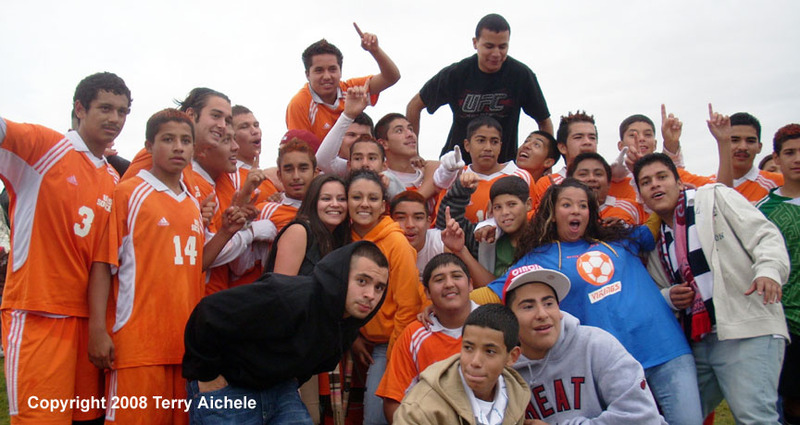 Umatilla Viking soccer players and fans celebrate their win against Riverside on Tuesday. 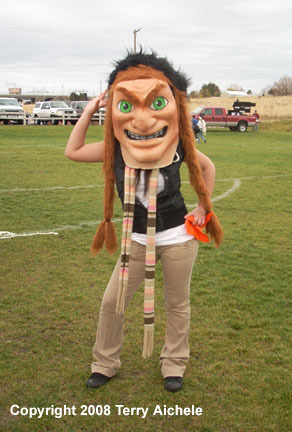 Umatilla will play Portland Christian Saturday, November 15, 2008 at Wilsonville High School at 1PM. on Saturday, November 15 at 1pm. Saturday, November 15 at pm. 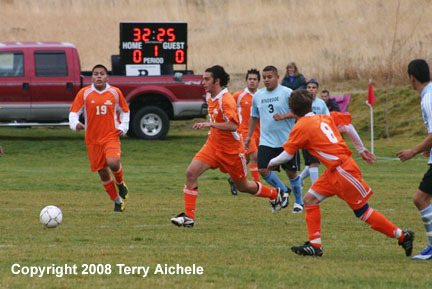 UMATILLA - The Umatilla Vikings defeated the Riverside Pirates 3-2 on Tuesday, November 11, 2008. The Vikings will go on to play Portland Christian for the state finals at Wilsonville on Saturday at 1PM. Umatilla showed cohesiveness and confidence in the win against a team that had defeated them twice during the season. The weather was cloudy and about 55 degrees at game time. 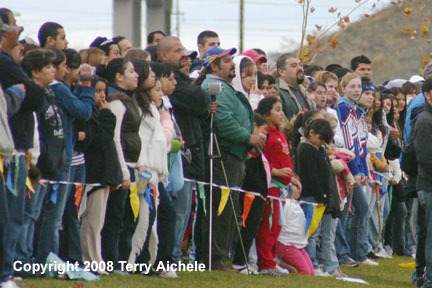 A large crowd of fans from both schools arrived to cheer the teams during the match. The majority of the first half was scoreless as both teams tried to find plays that would work. Riverside finally broke through with a goal 26 minutes into the first half. 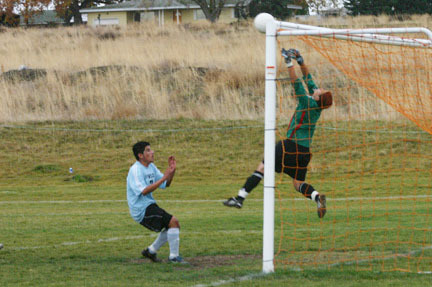 Juan Colin drove into the Umatilla zone and blasted a shot past Umatilla goalkeep. to take a 1-0 lead. Umatilla's Yeldar Orduna scored in the 29th minute shooting from the goalkeep's left side across the goal opening to the far corner tieing the score 1-1. 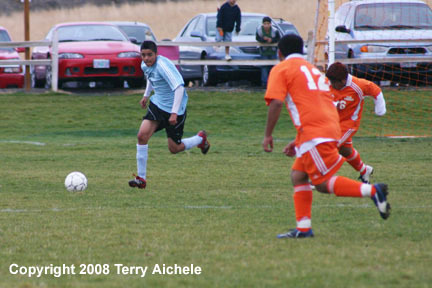 Mario Anaya of Umatilla scored next with a driving goal from directly in front of the Pirate goal. The goal gave Umatilla the 2-1 lead. Both teams took about the same number of shots on goal during the first half. It looked as if Riverside was working harder to get into range to take the shots. 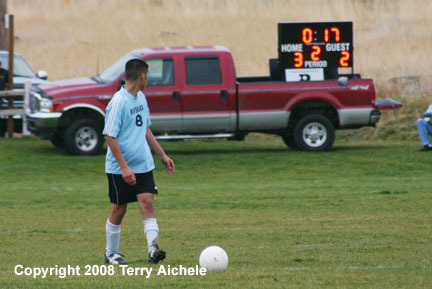 Umatilla was able to drive to the Riverside zone as the half went on. The first ten minutes of the second half was mostly played in the Riverside zone as the Vikings were able to put more pressure on the Pirates. The Pirates were able to hold off a Viking goal until the 16th minute when Mario Anaya scored his second goal on a drive up the middle drawing the Riverside goalkeep out of position. The goal gave Umatilla the 3-1 lead. Riverside players looked frustrated and whatever they tried it seemed like Umatilla was able to counter. At about the thirty minute mark Riverside seemed to pick up the pace of play and began trying different things to counter the successful defense that Umatilla was using. In the 33rd minute Hugo Morales of Riverside drove in against the Viking goalkeep's left side and drove a kick deep into the right side of the goal to make the score 3-2. As the final six minutes rolled Riverside tried to pressure the Umatilla defense to get another scoring opportunity. It seemed like Umatilla could close down the usual passing game that Riverside used. The teams played a spirited final six minutes. 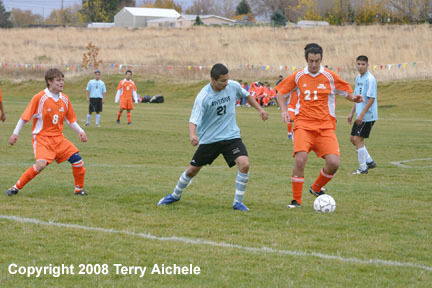 With about 30 seconds to play Alejandro Pacheco had the opportunity for a free kick. He set up the ball and his Riverside teammates set up a final play in an attempt to tie the score. Pacheco looked over his left shoulder to watch the clock count down to below 17 seconds and his kick into a Riverside set piece. 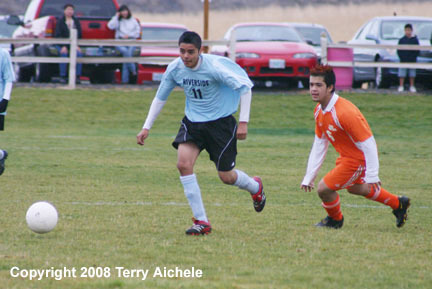 Riverside couldn't make anything and Umatilla took the win 3-2. Umatilla senior Mario Anaya was excited about the big win. "It feels really good going on to the finals. We haven't been to the finals so this is big. We had to keep trying our best to make it to the finals. We played our hearts out." "It was a nightmare. Every time we played Riverside they beat us and beat us and we got tired of it." Adrian Soto, a Umatilla junior, commented, "We had some tough times but we pulled it out." Umatilla junior Maximo Bedolla "It feels awesome. Last time went to the second round and this time it's the championship. It's a big difference." 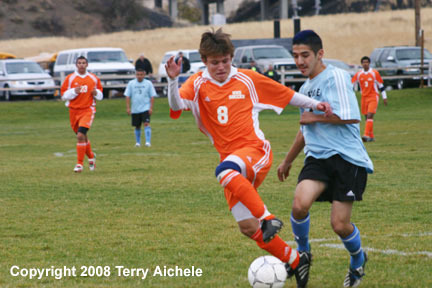 It was a lot of work for the midfielder. "I'm tired. I had to run alot. We had to play defense hard the last couple of minutes. They were trying to come back on us. But we held on. We bunched up on them so they couldn't do anything with the ball. We studied them well. We played them twice this year. They beat us 4-1 and 4-2 and this time we fixed our mistakes. Thanks to our coach and the people who came to watch us." Umatilla will travel to Wilsonville for the final against Portland Christian on Saturday November 15 at 1pm. LEFT - A Riverside cheerleader just moments before the match started. 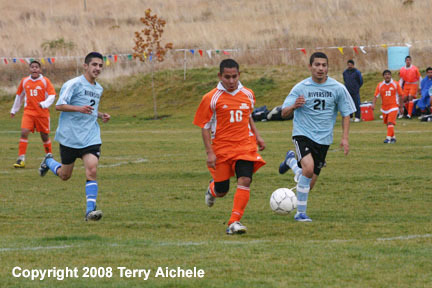 RIGHT - Umatilla players Mario Anaya, left, and Macrelli Massimiliano, right, work the ball past Riverside's Juan Manuel Llamas. 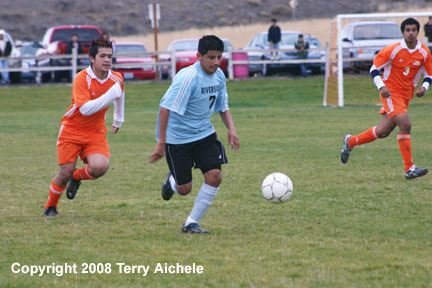 LEFT - Umatilla's Macrelli Massimiliano gets the ball past Juan Manuel Llamas of Riverside. 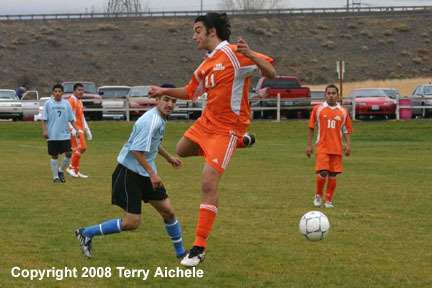 RIGHT - Umatilla's Macrelli Massimiliano flicks the ball backwards. LEFT - Umatilla players bring the ball into the Riverside zone during the first half of play. 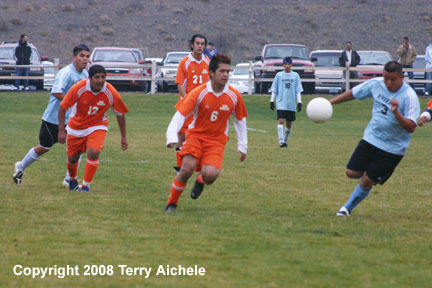 RIGHT - Viking Mario Anaya gets the ball past a Riverside defender. 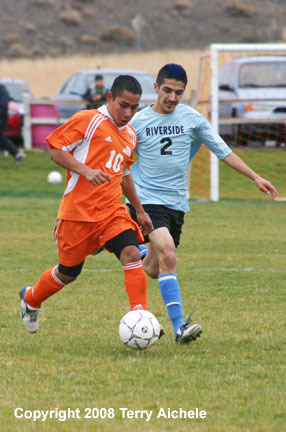 LEFT - Umatilla Yeldar Orduna brings the ball past Favian Madrigal of Riverside. RIGHT - Riverside takes a shot on goal during the first half of the match on Tuesday. Yeldar Orduna of Umatilla drives in for the first Viking goal to tie it up 1-1 in the first half. 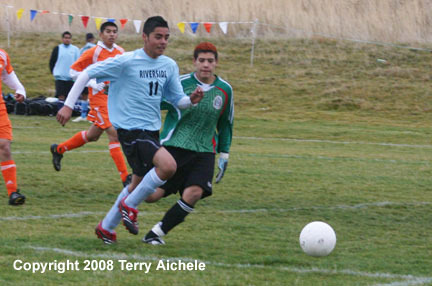 Mario Anaya of Umatilla pulls the Riverside goalkeep out of box on his way to score a goal. LEFT - Mario Anaya of Umatilla scores the goal to give the Vikings a 2-1 lead. 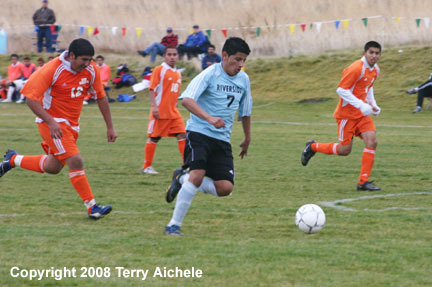 RIGHT - Riverside Pirates Oscar Madrigal and Christian Llamas break up a Umatilla pass. Riverside takes a shot on goal. 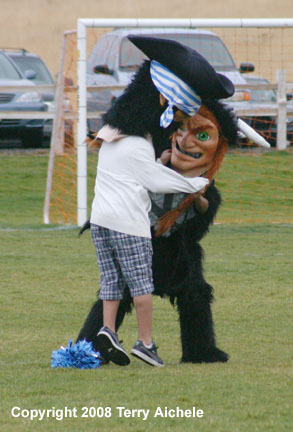 LEFT and RIGHT - The teams mascots held a good natured meeting at halftime of the match. 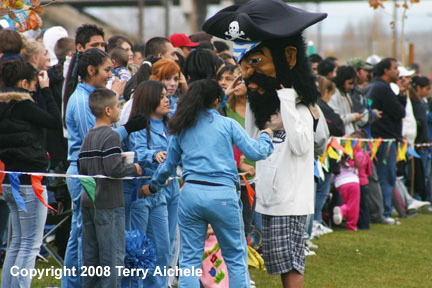 LEFT - The Riverside Pirate mascot waves his pompoms to the crowd. 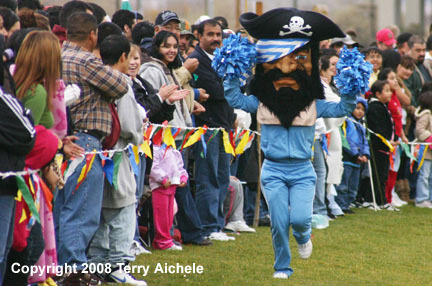 RIGHT - One of Riverside cheerleaders decides that it is her tern to wear the pirate head. 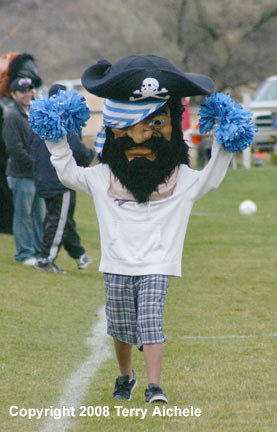 LEFT - The Riverside cheerleader Pirate seems get the crowd the smiling. 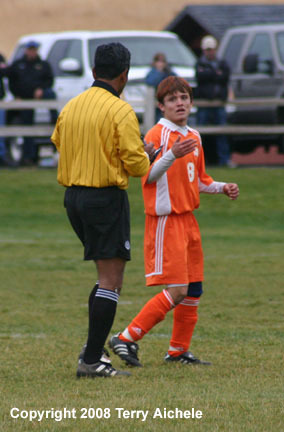 RIGHT - Mario Anaya of Umatilla talks to the referee about a yellow card that given to a teammate just a few moments before. Umatilla defenders Cesar Guzman and Christian Ortiz put some pressure on Riverside's Juan Colin. Umatilla's Mario Anaya, on the far right, reacts to getting a goal shot past an out of position Riverside goalkeep in the 16th minute of the second half. LEFT - Mario Anaya leaps into the arms of teammate Maximo Bedolla while Maxcrelli Massamiliano rushes up to join them. 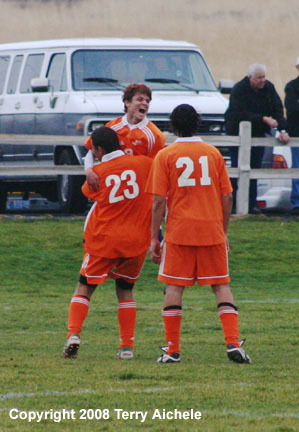 RIGHT - Umatilla players react to the goal by Mario Anaya. 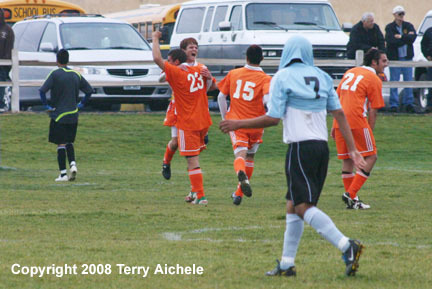 Umatilla Vikings celebrate the goal by Mario Anaya. 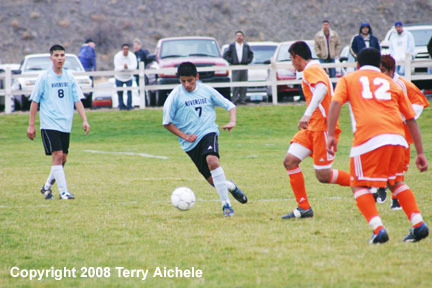 LEFT - Riverside's Erik Ruiz passes the ball. 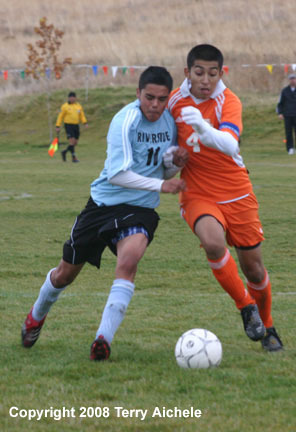 RIGHT - Umatilla's Antoinio Corona gets control of the ball from Pirate Erik Ruiz. LEFT - The crowd closely watches the match between Umatilla and Riverside. 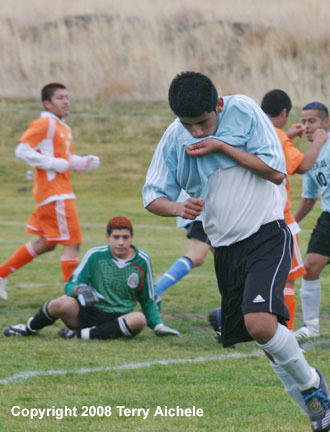 RIGHT - Riverside's Erik Ruiz misses a shot on goal. 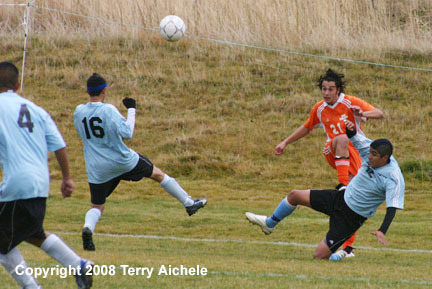 A Riverside player drives to the goal but has his shot blocked. 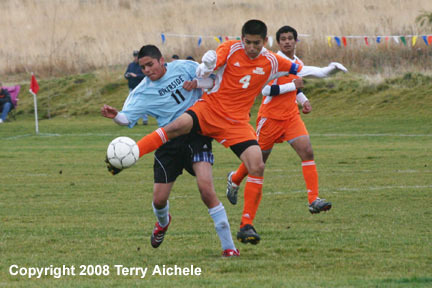 LEFT - Umatilla's Samuel Navarette breaks up a pass to Erik Ruiz of Riverside. 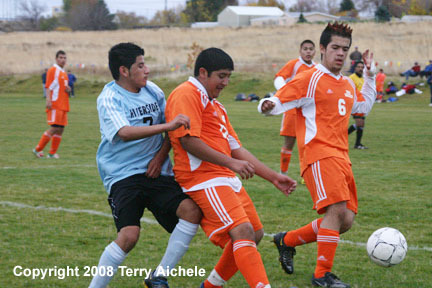 RIGHT - Viking Samuel Navarette pressures Pirate Erik Ruiz in front of the Umatilla goal. LEFT - Hugo Morales of Riverside drive in for a goal to close the gap to 3-2 in the 33rd minute of the second half. 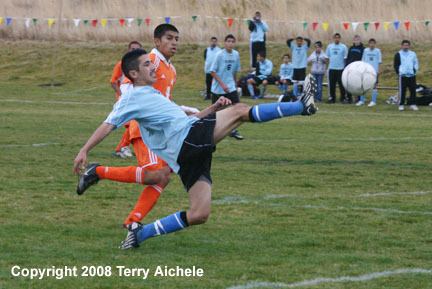 RIGHT - Hugo Morales of Riverside celebrates his goal while the Umatilla goalkeep picks himself up off the ground. LEFT - Riverside comes right back pressuring the Vikings with another drive by Hugo Morales. 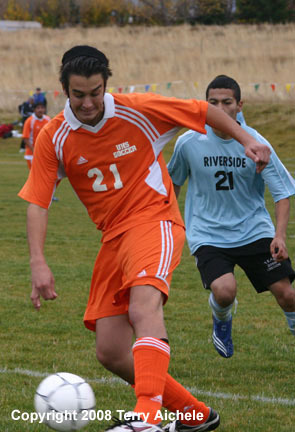 RIGHT - Erik Ruiz of Riverside brings the ball into the Umatilla zone late in the second half. 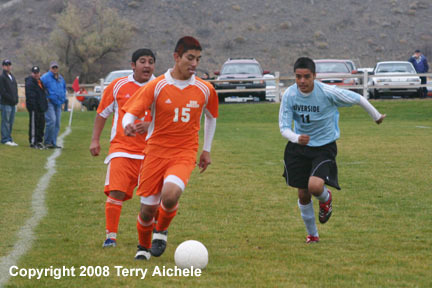 LEFT - Riverside's Hugo Morales makes another run on the Umatilla goal late in the match. RIGHT - Riverside's Favian Madrigal takes a shot on goal. LEFT - Umatilla defenders break up a drive to the goal by Riverside. RIGHT - Riverside's Alejandro Pacheco looks over his shoulder as the clock counts down to the last 17 seconds of the match before taking a free kick. 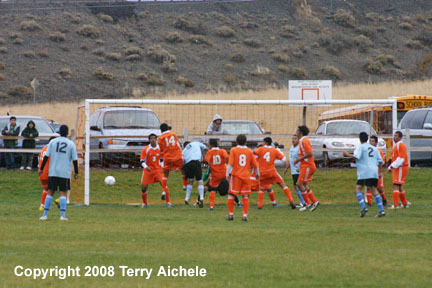 One of the last shots by Riverside is blocked by the Umatilla goalkeep. Riversides Iovani Barrera takes a shot on goal in the closing seconds of the match. It's Gatorade time as Umatilla celebrates their win over Riverside. 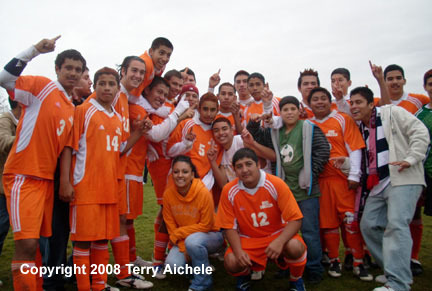 Umatilla Viking players, students and others celebrate the win following the 3-2 win over Riverside on Tuesday. 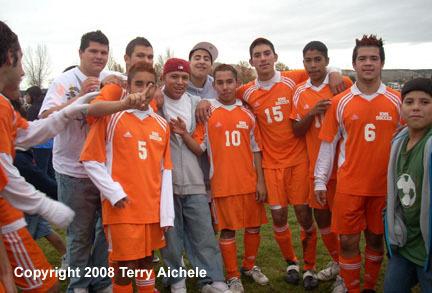 LEFT - Some of the Umatilla players after the match. RIGHT - The crowd of Viking players grows. 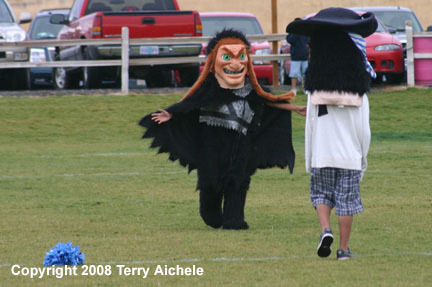 The Viking mascot has a big Saturday coming up this weekend. 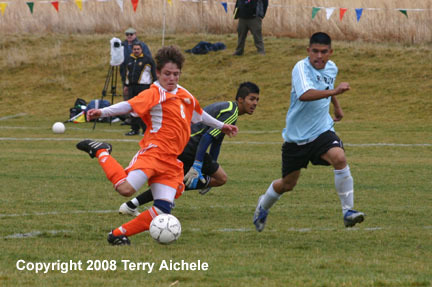 The soccer and football teams will both be playing at 1 pm on Saturday. The soccer team will play for the state championship at Wilsonville High School and the football team will play a quarterfinal round game at Gold Beach.